Download "The 2014 COLORADO. Workers Compensation Educational Conference"
1 The 2014 COLORADO Workers Compensation Educational Conference DoubleTree by Hilton Colorado Springs Hotel Colorado Springs, Colorado Presented by: The Colorado Division of Workers Compensation in association with the International Workers Compensation Foundation, a nonprofit corporation dedicated to workers compensation research and education. 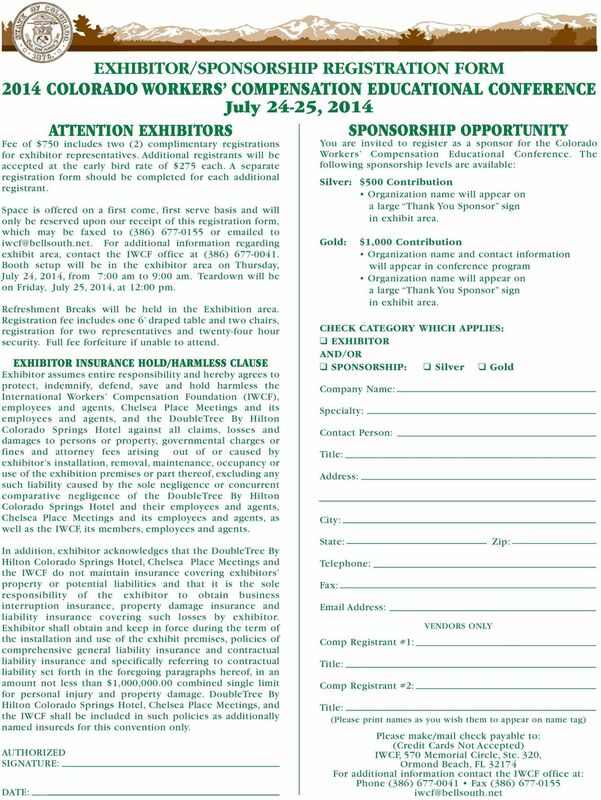 3 CONFERENCE REGISTRATION FORM THE 2014 COLORADO WORKERS COMPENSATION EDUCATIONAL CONFERENCE Complete, copy and return this form for each attendee along with a CHECK (Credit Cards Not Accepted) made payable to the IWCF (International Workers Compensation Foundation) and mail to: IWCF, 570 Memorial Circle, Suite 320, Ormond Beach, FL Registration Fees: $275 per person paid prior to or on June 15, 2014 (early bird rate) $325 per person paid after June 15, 2014 Name: (Please PRINT name as you wish it to appear on your name tag) Business Name: Title Address: City: State: Zip: Telephone: Fax: Area of Interest: Employer Employee Insurer Attorney Health Care Provider Other: LODGING - DoubleTree by Hilton Colorado Springs Hotel has been recently remodeled and is nestled in the foothills of the Southern Rocky Mountains located at 1775 East Cheyenne Mountain Blvd. A block of rooms has been reserved at the rate of $ single bed and $ for two beds plus applicable taxes. This rate will be available through June 24, 2014, unless this block becomes fully reserved prior to this date. 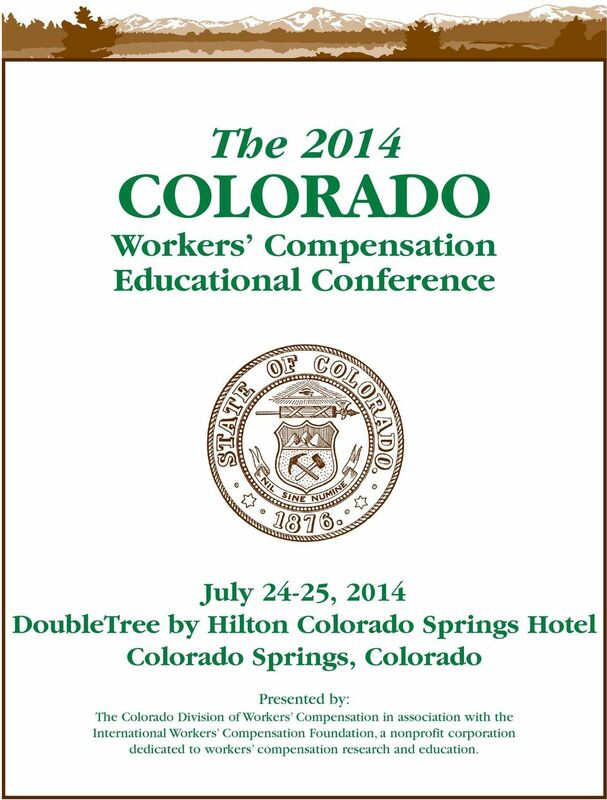 Indicate you are attending the 2014 Colorado Workers Compensation Educational Conference when calling to make your reservations. Register early by calling the DoubleTree s direct number, (719) CANCELLATION REFUND POLICY - Cancellation of preregistration must be made before 5:00 pm on July 11, Substitution of personnel is recommended in lieu of cancellation after that date. The full registration fee will be forfeited if you fail to attend or cancel timely. CONTINUING EDUCATION CREDITS - Application will be made for CLE and CRC/CDMS/CCM credits. Any other discipline will be provided, upon request, with certificate of completion for credit submission. SPECIAL NEEDS - Individuals attending the conference who may need auxiliary aids or special services are requested to provide notice of their needs in writing no later than 10 working days before the conference so that appropriate arrangements can be made. DRESS CODE - Casual clothing is appropriate for all events. For further information contact the IWCF office at (386) , Fax (386) , or Net proceeds from this event, if any, go to the International Workers Compensation Foundation (FEIN# ), a non-profit organization, to further its work in workers compensation education and research. 4 THE 2014 COLORADO WORKERS COMPENSATION EDUCATIONAL CONFERENCE The Colorado Division of Workers Compensation and the International Workers Compensation Foundation are jointly sponsoring an Educational Conference which is unique in Colorado. The goal of this conference is to educate those who participate in the Colorado workers compensation system regarding current rules, procedures, policies and forms and to provide an opportunity for dialogue among these participants. Breakout sessions will be utilized to discuss certain topics in specific detail for a more specialized view while other topics will be presented from a more general perspective. Who Should Attend? All employers, insurance adjusters, self-insurers, third party administrators, safety and human resource managers, plaintiffs and defense attorneys, health care providers, mediators and medical and vocational rehabilitation providers are encouraged to attend. 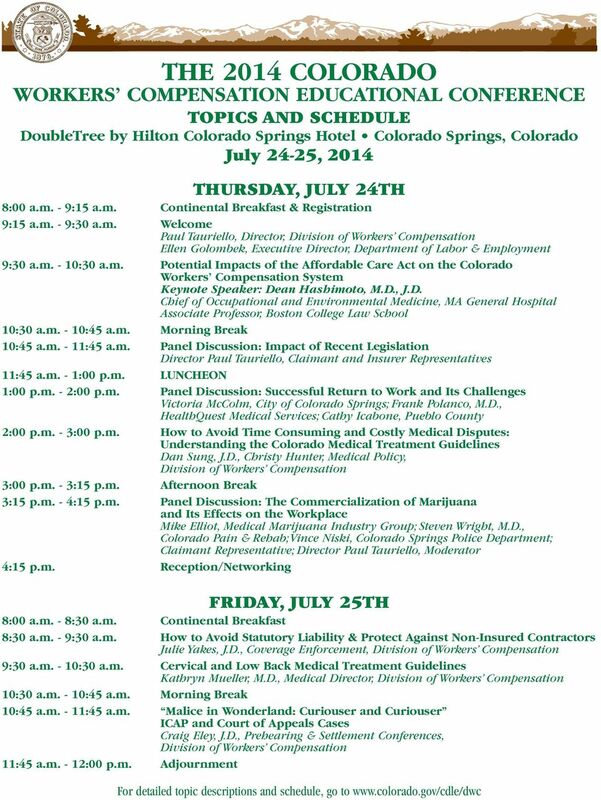 In fact, anyone interested in the workers compensation system in Colorado will receive valuable information at the conference. 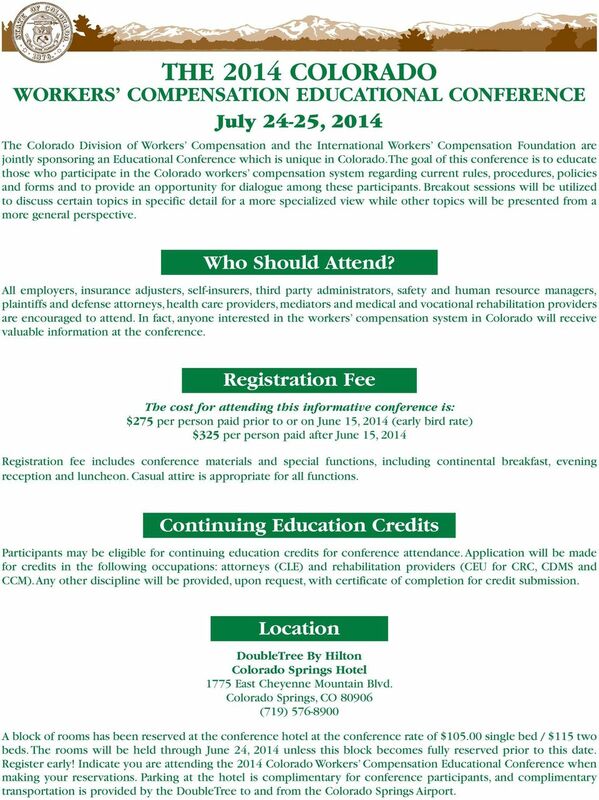 Registration Fee The cost for attending this informative conference is: $275 per person paid prior to or on June 15, 2014 (early bird rate) $325 per person paid after June 15, 2014 Registration fee includes conference materials and special functions, including continental breakfast, evening reception and luncheon. Casual attire is appropriate for all functions. Continuing Education Credits Participants may be eligible for continuing education credits for conference attendance. Application will be made for credits in the following occupations: attorneys (CLE) and rehabilitation providers (CEU for CRC, CDMS and CCM). Any other discipline will be provided, upon request, with certificate of completion for credit submission. Location DoubleTree By Hilton Colorado Springs Hotel 1775 East Cheyenne Mountain Blvd. Colorado Springs, CO (719) A block of rooms has been reserved at the conference hotel at the conference rate of $ single bed / $115 two beds. The rooms will be held through June 24, 2014 unless this block becomes fully reserved prior to this date. Register early! 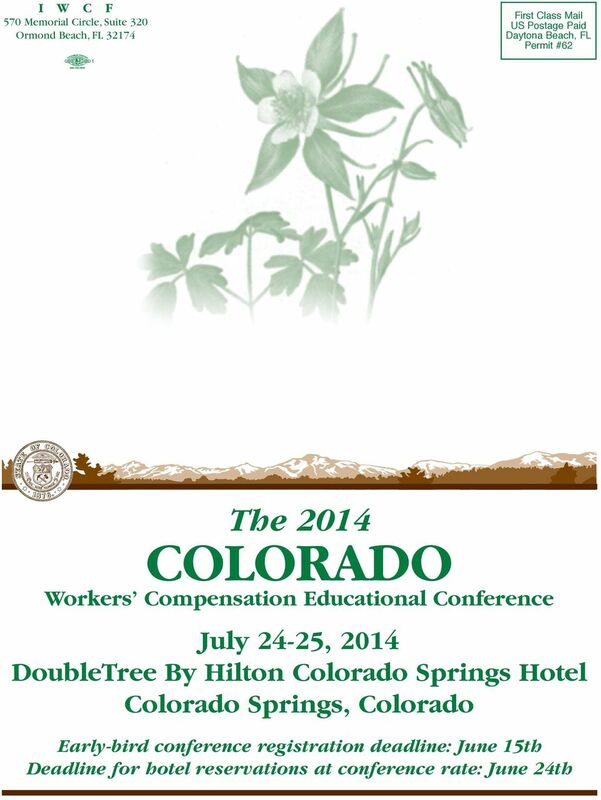 Indicate you are attending the 2014 Colorado Workers Compensation Educational Conference when making your reservations. Parking at the hotel is complimentary for conference participants, and complimentary transportation is provided by the DoubleTree to and from the Colorado Springs Airport. The American Association of Oral and Maxillofacial Surgeons (AAOMS) is pleased to offer your company the opportunity to come face-to-face with decision-makers in your market at the 97 th Annual Meeting. The American Association of Oral and Maxillofacial Surgeons (AAOMS) is pleased to offer your company the opportunity to come face-to-face with decision-makers in your market at the 98 th Annual Meeting. August, 2014. For sponsorship and exhibitor inquiries, contact Colleen Bartos at cbartos@vt.edu or 540 231 7832. Come Great. Opportunities NAFED2015. Exhibitor Prospectus WITH GREAT CHALLENGES. CONFERENCES Exhibit your solutions. Build your business. ASSOCIATE MEMBERSHIP. and EXHIBITOR OPPORTUNITIES. leading momentum. About New Horizons. Why should you exhibit at New Horizons? Clear Hills County invites you to the 22nd annual Agricultural Trade Show! Reserve Your Booth Today Here's How The Expo takes place from 9:00 a.m. to 4:00 p.m. on Saturday, and 11:00 a.m. to 4:00 p.m. on Sunday.